Ctrl+; enters the current date. Ctrl+: enters the current time. The following table presents a list of customers. They are collecting the points. Membership depends on the number of points. 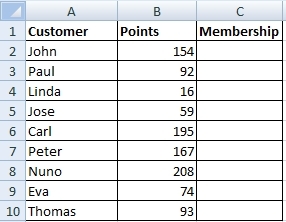 The task is to assign correct membership from points intervals.